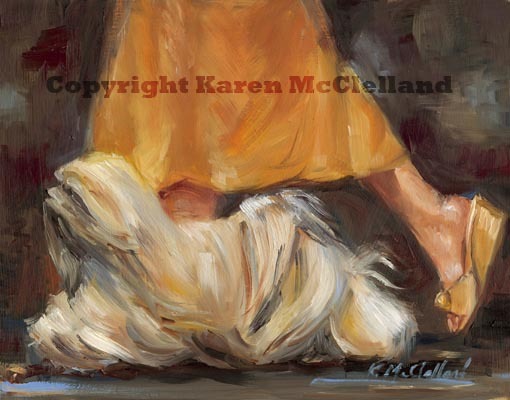 Lhasa Apso Dog limited edition giclee art print, dog painting done by artist Karen McClelland titled "Lhasa on the Move"
Lhasa Apso Dog print titled "Lhasa on the Move"
One of the paintings done as a trophy (three are currently available as giclee reproductions) for the 2008 Lhasa Apso national specialty. I have wanted to do this sort of painting for many years, I love the concept and the flowing coat. The Lhasa national gave me the opportunity to finally get it done. I have been so pleased with every aspect of the painting that I may do another along the same lines.